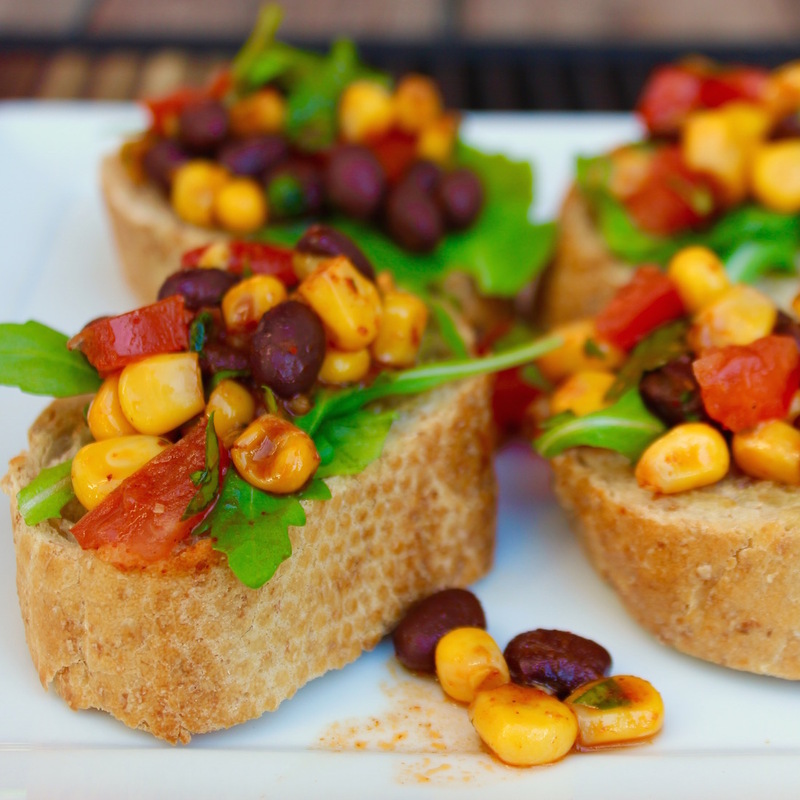 A super tasty Mexican inspired bruschetta. 1½ cups frozen corn, rinsed to thaw. Drain well. 2 garlic cloves pressed into a small bowl with 2 tbsp olive oil for 'painting' toasted bruschetta before assembling. Heat the 2 tbsp of canola oil in a large skillet over medium heat. Add the 4 cloves of pressed garlic and cook for about 30 seconds. Add the chili powder and salt and stir to combine. Remove from the heat and add your chopped tomatoes, cilantro, and lime juice. Mix well. Put your baguette slices in the oven to toast for about 2 minutes or golden. Using a pastry brush dip the brush into the small bowl with the olive oil/ pressed garlic and lightly 'paint' the surface of each slice of bread. Cover with thin layer of arugula and then top with bean/ veggie mix to serve.